The MSU General Assembly (GA) is the constitutionally-mandated annual meeting of all full-time undergraduate students (18 or more units), wherein any student may submit a topic for discussion or debate and speak for - or against - any issue. 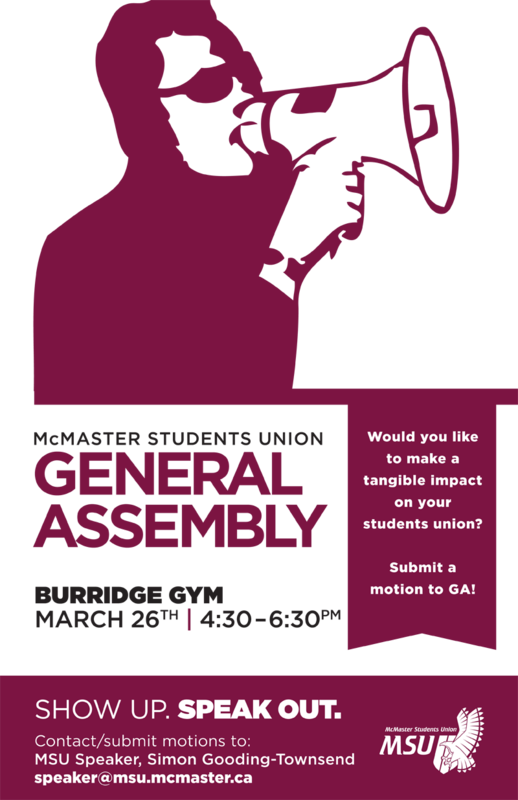 General Assembly is an opportunity to participate in the decision making process of the McMaster Students Union and have an opportunity to direct the MSU's actions. GA is a place where the business of students is brought before an open and public session, where individuals can have any business addressed and even have binding motions passed on the union. Please feel free to submit a motion for consideration at General Assembly. If you are unsure as to what constitutes a ‘motion’ and you simply have an idea or a matter you would like to see addressed at GA, please contact MSU Speaker Simon-Gooding Townsend (speaker@msu.mcmaster.ca ext. 24118) for clarification and help accessing the General Assembly agenda.